Skinner House Books, 9781558967380, 32pp. A story of Anne Frank, who loved a tree and the tree who promised never to forget her. 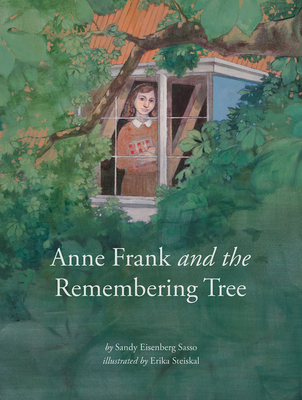 This book is co-published with the Children's Museum of Indianapolis, chosen by the Anne Frank Center as the first U.S. recipient of a sapling from the tree outside of the Secret Annex window (the tree is the narrator in the book). Sandy Eisenberg Sasso is an award-winning author of thirteen books for children, including God's Paintbrush, The Shema in the Mezuzah (winner of a National Jewish Book Award), and Creation's First Light. Visit her at www.allaboutand.com. Erika Steiskal grew up in Ohio and received a BFA in illustration from the Columbus College of Art and Design. Her book and editorial illustrations have appeared in Spectrum, 3x3, and Communication Arts, and her work received a gold medal from the Society of Illustrators Los Angeles. She lives in Seattle.